E-Government can be seen as governing through the use of information technology, and a key component of e-Government is e-Participation, the use of information and communications technologies to engage citizens more closely in government processes. Public participation is achieved by a range of means, any or all of which might benefit from the use of technology in order to reduce costs and improve effectiveness. In South Africa, the public has a generally poor opinion of government services, even though Web and mobile technologies are being used. That sentiment sometimes ensues in social tensions. 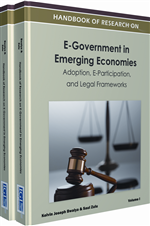 In this chapter, a review of literature, opinions of informed experts, and a scenario analysis develop indications and a model for e-Participation maturing with e-readiness improving. Public participation has, to a greater or lesser degree, been a feature of government ever since the first democracies were established. Over time there have been variations in the degree of public participation according to the mood of the moment and the means to participate. Today, the widescale availability of communications technologies raises the prospect of hitherto unimagined levels of participation, but if we look at South Africa (as one example of a recent democracy) we find that all is not well. There are efforts to introduce new facilities for participation, sometimes with a high level of dependency on technology, but the level of public satisfaction with government services is very poor. This Chapter examines public participation in the South African context, starting with a general review of “e-Participation” as a feature of “e-government”, and progressing to conclusions about the pre-conditions for the successful use of technology in public participation. The Chapter notes the availability of web and mobile technologies, but does not involve itself in the details; as will become clear, the issues are more concerned with the processes of participation and the quality of implementation. In the 1990s, close on the heels of the Internet, came the World Wide Web. A clear sense soon emerged of how ubiquitous the storage and exchange of digital information would become, and how it would begin to touch all aspects of our lives. We can now envisage that anyone can produce information, from anywhere, to anywhere, and for everybody. Businesses – struggling to shed the blinkered attitudes of twenty or more years work with mainframes – have doubled their efforts to gain efficiency, reduce operational costs, find new competitive advantage, and gain other benefits deriving from the new technologies. At the same time, consumers are now newly empowered to influence the specification and production of the goods and services that they want. Communities have formed around the capability to communicate and share interests and needs. Suddenly, we were talking about “ICT4D” (Information and Communication Technology for Development) (Heeks, 2008) and “Social and community informatics” (Bradley, 2006; Gurstein, 2000; Kling, 1996, 1999; Schuler, 1994). The combination of communications technology in business, communities, government and in the life of every individual makes an interesting mixture that challenges all our assumptions about our roles as consumers, employees, tax payers, public service recipients, or simply community members. On the government side, interest in ICT-mediated forms of government has burgeoned and the term “e-government” is now an established feature of the modern vocabulary. The overall benefits are clearly concerned with improving the quality of public services at a lower cost. The questions arise: are governments achieving these benefits, and are their citizens better off? “The use of information and communication technologies to engage citizens, support the democratic decision-making processes and strengthen representative democracy” (Macintosh, 2004). Here we choose the term “e-Participation” to place a clear focus on the engagement of citizens, and the role of communications technologies in engaging them. ICT4D: ICT for development is a field of research and practice joining specialities from computer science, information systems and development studies. E-Readiness: Network readiness index estimating the level of progress of a given entity (country) in developing significantly the quality and the extent of it ICT infrastructure, e-skills and relevant regulations. E-participation: Effort for bettering political participation of citizen by enabling communication and deliberation amongst them and with their political authorities, using ICTs. Public Participation: Communication process that informs, consults and involves the citizens in Government’s activities of decision and law and policy making.